The AGILE Academy officially kicked off last month at the German Aerospace Center (DLR) in Hamburg. This initiative is aimed at exposing aerospace engineering master’s students to aircraft multidisciplinary design optimization (MDO) techniques in order to develop better aircraft design. AGILE (Aircraft 3rd Generation MDO for Innovative Collaboration of Heterogeneous Teams of Experts) is a Horizon2020 project in which TU Delft (Delft University of Technology) and eighteen partners from Europe, Canada and Russia work on the development of new Aircraft MDO processes to reduce aircraft development cost and lead to cheaper and greener aircraft. The AGILE Academy is an initiative within the AGILE dissemination plan, aiming at exposing aerospace engineering master’s students to the latest techniques to perform MDO in a collaborative environment. The final goal is to grow a new generation of young engineers capable of developing better aircraft designs by means of MDO. The initiative was started by Aerospace Engineering Assistant Professor Gianfranco La Rocca (FPP) and DLR project coordinator Pier Davide Ciampa (DLR project coordinator). 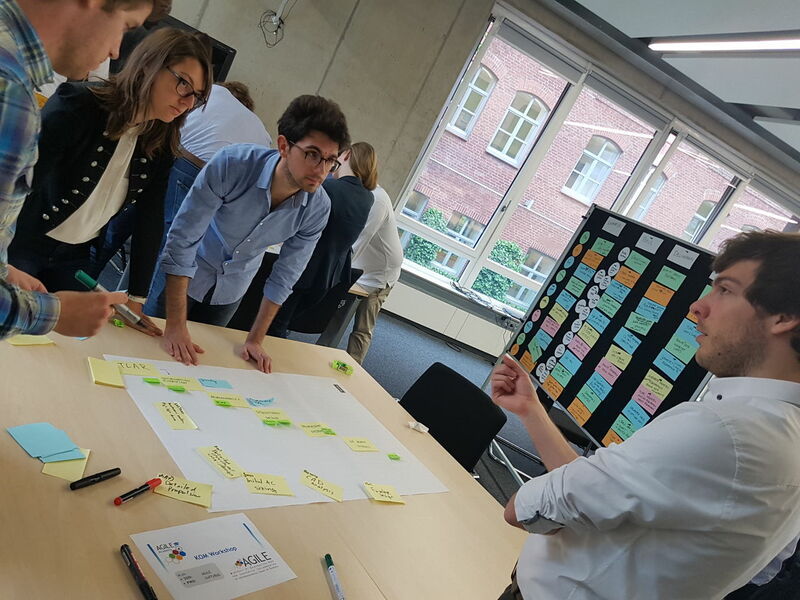 From 15-17 May, eight master’s students from the four participating universities, TU Delft (FPP), RWTH Aachen, Politecnico di Torino and University of Naples Federico II, attended the first AGILE Academy workshop. Three FPP students participated in the workshop: Roy Groot, Jonas Kaminski, and Thaïs Smeets. AE PhD candidate and lead researcher in AGILE, Imco van Gent, was one of the workshop organizers and instructors. During the three-day workshop, the students were first introduced to the different tools available and developed within AGILE to perform collaborative MDO on a distributed network of computers. After that the students kicked off a three-month case study in which they will try to design and optimize a turboprop configuration using their personally developed aircraft design tools to analyze aerodynamics, structures, performance, and other disciplines. After this first round of the AGILE academy is completed, a second round will be initiated in which also students from universities and institutes outside the AGILE project will be able to join in the so called ‘AGILE challenge’. Mixed teams of students from different countries will compete in the collaborative design and optimization of an aircraft, using the ‘AGILE approach’.